Representatives of the government and the opposition remain optimistic of a resolution to a six-month long political crisis with home minister stating that the government is open to exploring avenues to release jailed politicians and withdraw charges against opposition supporters. The main opposition Maldivian Democratic Party (MDP) submitted tonight a list with some 1493 people, who are either in jail, facing charges or under investigation for political activities. At a second meeting with the government on Sunday night, MDP also requested a two-week timeline to come to agreements on President Abdulla Yameen’s agenda of political reconciliation, constitutional and judicial reform, and participatory development. The government has, meanwhile, conceded to all-party talks at a later stage and agreed to allow parties to decide on who will represent them at the talks. The Maldives has been gripped by turmoil since the arrest and imprisonment of several politicians, including ex-president Mohamed Nasheed. In the ensuing crisis, hundreds were arrested and three leaders were charged with terrorism. Diplomatic pressure has been mounting on President Yameen to release all political prisoners. A third meeting will be held on Wednesday. 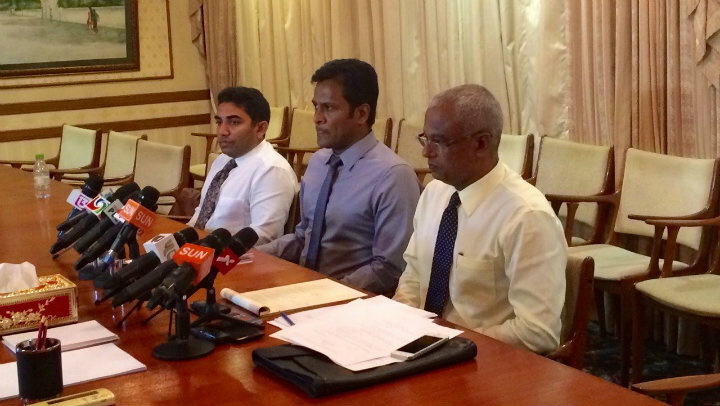 The government will answer MDP’s demands and make demands of its own in return. Fisheries minister Mohamed Shainee and president’s office minister Abdulla Ameen also participated in tonight’s meeting. 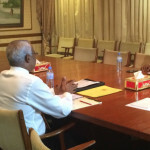 At the first meeting on July 1, the MDP had proposed five rules to proceed with talks, including joint talks, and conducting talks in three stages. Naseer and Ibu tonight said that the two parties will discuss measures for political reconciliation at the first stage, and will invite the Jumhooree Party and religious conservative Adhaalath Party to discussions on constitutional and judicial reform, and participatory development at the second and third stages of talks. Separate teams of ministers are in discussions with the JP and the Adhaalath Party. Although the government tonight withdrew a veto on Nasheed representing the MDP at talks, it is not clear if he will be physically present at the meetings. 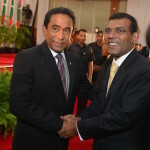 The opposition leader was transferred to house arrest in late June after the opposition backed a constitutional change that would allow President Yameen to replace his deputy. Naseer also blocked a question whether the government plans to repeal a law that had stripped Nasheed of the MDP presidency. 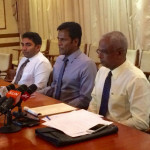 The MDP has also called for a constitutional change to a parliamentary system, contending that the presidential system of government has failed in the Maldives. The tax authority last week removed a freeze on Gasim’s Villa Group accounts. If you read comments on Haveer about release of Nasheed, most people want Nshaeed in prison for the country and religion. This raises question if Nasheed really jailed because he is a terrorist or he is incarcerated for political reason. If Nasheed is jailed for political gain with the help of conservative mindset and for political revenge, every single minute he spends under custody of his captors is serious human right abuse. How can UN tolerate such gross violation of human rights by its small ant size member? It is obvious that some parts of Maldivian population are happy with this barbarism, therefore a serious action even if it will do harm on the population should not be ruled out. Economic sanction and travel ban of the Government is the only option. Yameen should not be allowed in Germany for his treatment. Such people enjoy democracy and freedom in other countries and at the same time defy the universal human rights for his own people. Question is; will there be any talk once the 26th July function is over? Will not everything go back to square one? The Maldives is up against a bunch who are clever in finding short term solutions!